Sold in October 2012 to a client in Singapore, the 35 metre explorer motor yacht Tango 5 was launched by Horizon last weekend, making her one of the last yachts launched in 2012. Tango 5 is the first yacht from the EP115 series. Designed for long cruises, she features a steel hull, a bulbous bow and a stern cockpit for fishing and diving. Her voluminous interior accommodates eight guests in four cabins. The crew quarters are for six in three cabins. Built to Bureau Veritas class, Tango 5 is powered twin 1,100hp MAN engines giving her a range of 3,000 nautical miles at 10 knots. Tango 5 will undergo sea trials during the next couple of months. 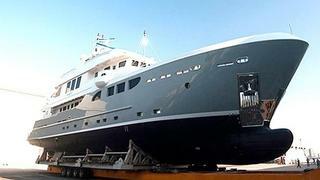 Her delivery is scheduled for March, and she will make her debut at the Boat Asia Show in April.